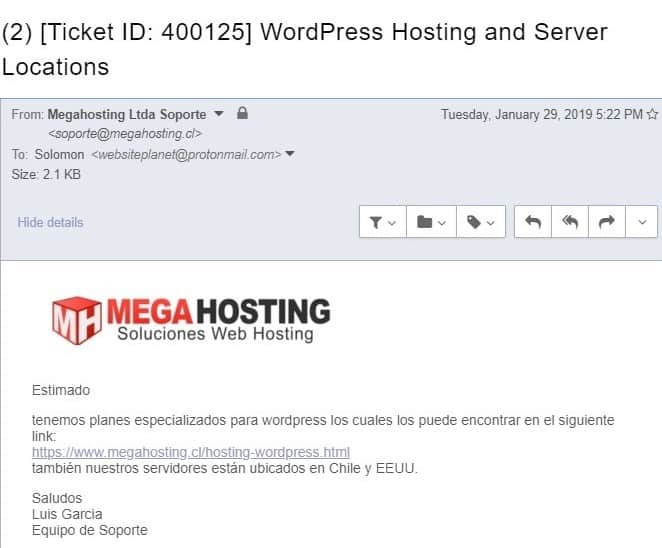 MegaHosting.cl Review 2019: Is MegaHosting.cl a Good Hosting? MegaHosting.cl offers powerful servers backed by a highly trained staff with a commitment to helping its customers set up and manage their websites. Established more than 15 years ago, the vendor has been providing hosting solutions for personal, business, and high traffic websites to its customers in Chile. MegaHosting.cl was formed by a group of young IT engineers who shared the same vision and love for technology. Their main aim was to provide powerful hosting solutions for personal, business, and high traffic websites to customers across Chile and beyond. The company was started more than 15 years, and over the years, it has become a force to be reckoned with. Today, it has over 15,000 customers. The MegaHosting.cl website is only available in Spanish. MegaHosting.cl keeps a sharp eye on the changes taking place in the technology space, incorporating emerging technologies to provide better hosting solutions to its clientele in Chile and beyond. The vendor regularly updates and improves its server configurations for continued optimal performance. It uses powerful Dell servers which operate under Raid hardware and solid state disks (SSD) for faster loading websites. MegaHosting.cl hosting plans are designed for all types of customers including those with resource-intensive websites. They come with lots of space, significant data transfer bandwidths, and corporate email accounts among other features. This hosting provider’s shared web hosting solution comes in three packages: Initial Hosting, Business Hosting, and Premium Hosting. Initial hosting is further divided into nine plans, including M-Personal Hosting, Hosting M-inicial, M-economic Hosting, and Hosting M-Diamont. The M-economic hosting is the most basic package. It comes with 2GB disk space, 20 email accounts, two MySQL databases, and 100 emails every hour. The Hosting M-Diamont plan is the most advanced. It includes 80GB disk space, unlimited email accounts, unlimited websites, unlimited MySQL databases, and 1,000 emails every hour. MegaHosting.cl performs offers backup services to its customers. The vendor performs these backups on a daily, weekly, and monthly basis, ensuring the safety of its customers’ files following a data loss event. 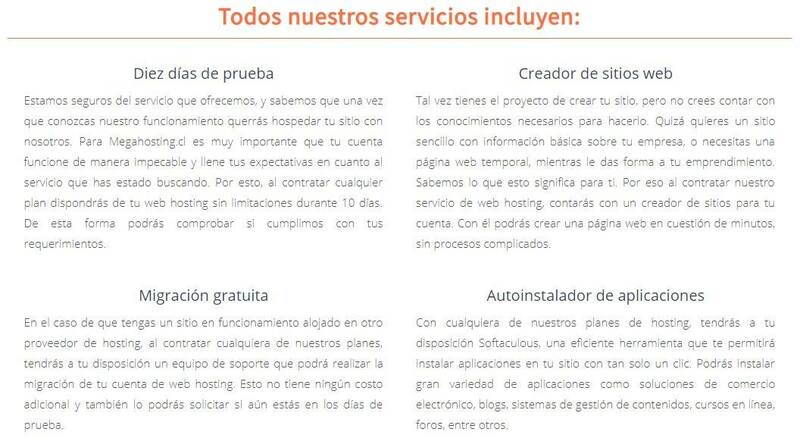 MegaHosting.cl hosting plans are quite affordable and prices are listed on the vendor’s website in Chilean pesos. The vendor charges its clients’ accounts on a biannual or annual basis. The vendor offers free migration and a ten-day free trial instead of a money-back guarantee. The hosting provider also offers a 99.99% uptime guarantee. You can reach out to the MegaHosting.cl technical support team via live chat or ticketing system. Although this vendor has not made available a support phone number, its support team is still available 24/7. I contacted this vendor’s support team via live chat but received no response. So, I tried getting in touch with them via ticketing system, and they responded to my queries after just under six hours from the time I opened a ticket. MegaHosting.cl knowledge base is practically empty. The hosting company has a video tutorials section but it does not contain any videos. Instead, the vendor has put up a “we will be back soon” sign. The MegaHosting.cl ten-day free trial is an attractive offering for many webmasters and an excellent way to try out its hosting solutions. The vendor’s long list of hosting packages for users to choose from ensures that all types of businesses find a plan that would be a perfect fit for their needs. Start your 10-day free hosting trial at MegaHosting.cl! Wondering how MegaHosting.cl stacks up against other Web Hosting companies? Enter any other Web Hosting company and we will give you a side-by-side comparison.